Form Description: Babysitters can be a literal lifesaver to parents, and offer many parents the opportunity to take some time away from their children and reconnect. However, unless you take the time to pass on some rather important information to your babysitter, it can also be a somewhat stressful time. With the help of this Babysitter Information Form you will be able to pass on vital information that your babysitter simply needs to know. Instead of having your babysitter trying to remember everything, all they need to do is look at this form. This particular edition of the form has been created with a fancier typeface. Who says that your personal forms need to be boring and dull? 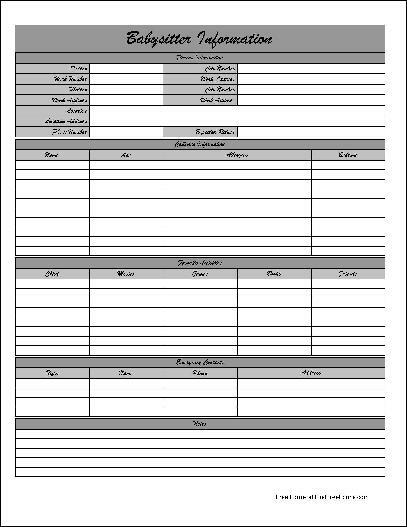 Show a bit of your family�s personality with the help of this version of the form. This form (" Fancy Babysitter Information Form") is associated with the following keywords: Family, babysitter, information, log, parents, children, fancy.